A shooter opened fire today around 12:30 p.m. at the North Harris Campus of Lone Star Community College. 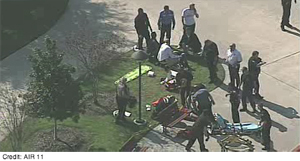 KHOU is reporting that at least three people, including a suspect, have been shot. Law enforcement officers are searching for a second suspect. Lone Star College is currently on lockdown, along with several neighboring Aldine ISD schools. Stay tuned for updated details.